No home or office decor is complete without an attractive place to store your books. 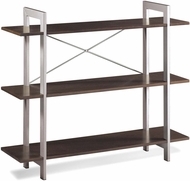 Choose an affordable bookcase from Office Chairs Unlimited's diverse selection of size and colors. Even in this technology-driven day and age, few things satisfy like curling up with a quality book. Here at Office Chairs Unlimited, we understand that there are still plenty of physical book lovers in the world, which is why we offer some of the finest bookcases around. Our wide selection of book shelves are great for storing your beloved book collection and make a great centerpiece for any living room. With a collection of both antique and modern library book shelves, there an endless amount of ways you can put your literature on display. With physical books becoming more and more rare these days, a stylish bookcase is sure to get a conversation going in any household.